The Total Control Software Point of Sale Terminal is an integrated part of the Parts & Service module, and supports “over the counter” sales of inventoried and non-inventoried items from your Ship’s Store, Parts Counter, Fuel Dock, Tackle or Pro Shop. 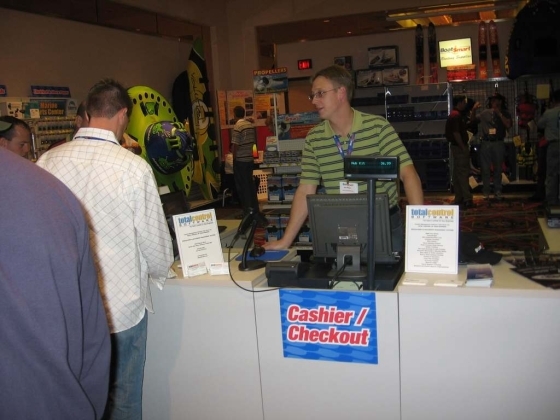 A full complement of peripherals is supported to include electronic cash drawers, receipt printers, barcode scanners, magnetic stripe card readers and pole/ tabletop displays. With barcode recognition and support for integrated credit, debit, and gift processing, sales transactions are fast and easy. Multiple payment types are supported per transaction. End of day closeout is fast and easy with daily sales reports that detail totals by cash register number and payment method. Call us today to see how we can help your dealership! See what our current customers have to say about our software solutions! Order Point of Sale Hardware, credit card readers, cash drawers, printing supplies and more! Call Total Control Software For Current Models and Pricing. Copyright © 2011 Total Control Software Corporation. All rights reserved.